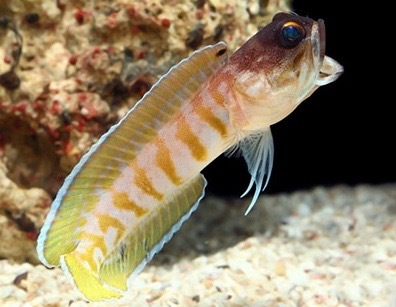 The Tiger Jawfish (Opistognathus randalli) is commonly available in the trade. These fish can be tricky to acclimate but once settled in they are pretty hardy. They require a sand bed as they tunnel near rocks’ bottoms. I’ve tagged them as carnivores but it is possible to get them eating pellets and flake food after they are acclimated to aquarium life. They breed readily in captivity but be careful when introducing multiple Tiger Jawfish into the same system. They can get aggressive with each other to the point of death. They do much better in reef tanks that do not house aggressive fish. I’ve personally seen butterflyfish, angels, and filefish pick on jawfish. As with most jawfish, a cover is required as they are prone to jumping.